Prince of Wales Mansions was the last block to be built on Prince of Wales Drive in 1902 by Gill Knight. These blocks back onto Albert Palace Mansions in Lurline Gardens. Prince of Wales Mansions consist of a linked group of ten blocks of five storey flats. Each block is of red brick construction and accessed centrally between flanking gabled bays. Entrances to each block are very distinctive with Classical rendered porticoes of varying designs some with an arch above at roof level. Battersea Park station was named after the nearby park. Battersea Park is a 200 acre green space situated on the south bank of the River Thames opposite Chelsea. Battersea Park station named after the park, and at first called York Road, opened in 1867. The first station to carry the name Battersea Park had been opened by the London, Brighton and South Coast Railway as Battersea in 1860 and was located at the southern end of what is now Grosvenor Bridge. It was named Battersea Park on 1 July 1862 but was sometimes called Battersea Park and Steamboat Pier. It closed on 1 November 1870 concurrently with the opening of Grosvenor Road station situated at the north end of Grosvenor Bridge. 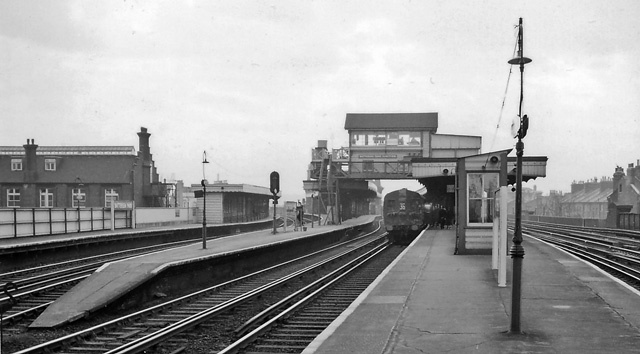 The London Brighton and South Coast Railway opened a high-level line between Pouparts Junction and Battersea Pier Junction on 1 May 1867 as a means of reducing congestion at Stewarts Lane. York Road (Battersea) station opened at this time. The station was renamed Battersea Park and York Road 1 January 1877 and Battersea Park on 1 June 1885.